A look back at the stories most likely to have implications going forward in 2014. This strikes me as the most important regional geopolitical event of the year, because it effectively ratifies what many analysts have suspected of coming for a long time – a Sino-Japanese competition over Asia, with the U.S. hovering in the background, tilting toward Japan. This will be the defining competition of Asia for the next several decades, and the trend-lines broadly favor China – Japan and the U.S. are in decline relative to China. It is true that China has been playing tough in Southeast Asia for awhile. But Japan is a significantly more important opponent for China than any player in Southeast Asia. Japan is the world’s third largest GDP, right behind China itself. It is far more capable of fighting and defeating China than anyone else in Asia. China and Japan have tangled on-off since the nineteenth century over regional primacy, so there is plenty of bad blood. The U.S. is a close ally with Japan, so any Chinese pressure on Japan inevitably chain-gangs in the U.S. Where the U.S. might duck Chinese pressure on the Philippines, it cannot on Japan. And northeast Asia is far more compact than the South China Sea. As the overlapping ADIZs suggest, there is a lot of “lateral pressure” in this crowded neighborhood. At the time, I argued war was in fact unlikely. And in retrospect, it seems this was just one more incident of North Korea acting out. So why reconsider it now? First, at the time, no one really knew. The U.S. got so nervous, it stationed missile defense in Guam to shoot down potential North Korean outbounds. Our knowledge of NK decision-making is so poor, that its rhetoric at the time really did scare people. I actually lectured in class at the time about what to do if North Korea dropped a nuclear weapon on the city I live in (Busan, Korea). And if Pyongyang were to talk that way again, another war crisis would ensure. One day, one of these crises might finally slip out of control. Second, Pyongyang threatened to nuke the United States, a first in its history. That effectively sealed the continuing U.S.-North Korean breach under the new Kim. That war crisis ended any hope that Kim Jong Un might be a Gorbachev. Indeed, he seemed more bellicose than either his father or grandfather, neither of whom openly threatened the United States like that. Peaceful leadership transitions in China are still pretty remarkable (although they do seem to be becoming institutionalized since Deng Xiaoping). And given the size of China’s economy and growing reach of its military, its new team is huge news no matter what it does. While stability and gradualism at home seems to be the agenda, Xi Jinping seems to be striking a tougher line in foreign policy. It is not clear if the People’s Liberation Army pushed him into the ADIZ expansion, or if Xi approved of it himself. But either way, the shift of Chinese maritime pressure under Xi from southeast to northeast Asia is a major step. It suggests Xi intends to run with nationalism in Chinese foreign policy, picking fights over territories and zones of influence. This will only worsen Western, and especially Japanese, paranoia that China is an Asian version of Wilhelmine Germany, and that Senkaku/Diayou is the region’s Alsace-Lorraine. If aggrieved Chinese nationalism is not bad enough, Shinzo Abe seems determined to match that with his own new Japanese patriotism, complete Yasukuni visits and textbook revisionism. 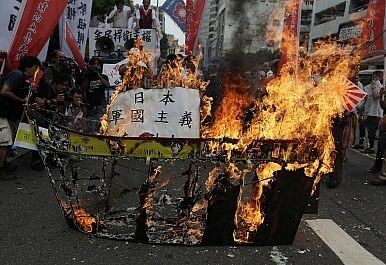 Abe clearly sees China as a challenger to Japan, one that must be meet and countered. Japan is now increasingly openly balancing China as an opponent. Asia is slipping into a bipolar cold war. Competing nationalisms tangling over incompatible territorial claims is a classic pathway to conflict. Fear is rising that the overlapping Japanese and Chinese ADIZs in the East China Sea will lead to collisions, fly-bys, and other brinksmanship incidents that might spiral out of control. Abe has also made it clear that he thinks South Korea is “hassling” Japan on history and other questions. Because of U.S. backing, Abe will feel less pressure to come to a terms with either China or Korea. A North Korean implosion would be an enormous geopolitical mess for all involved. Hence the focus on the extraordinary publicity of the recent Jang purge. The (North) Korean Central News Agency basically admitted what we all thought about North Korea under the Kim dynasty – that it is badly factionalized, that China’s great influence is unwanted, and that Kim Jong Un’s dilettantishness – publicizing his wife, visiting amusement parks, his bizarre dalliances with Dennis Rodman – has provoked real internal hostility. The Jang purge shows that the regime, as is the case with most autocracies, is in fact brittle. This seems like the most important internal conflict since Kim Il Sung’s purges in the 1950s of pro-Soviet and pro-Chinese factions. Kim Jong Un may be succeeding in consolidating power, but the ferocity of this purge gives concrete evidence for the first time in his reign that his take-over generated (the much-suspected) internal opposition. Factional splits in North Korea tend to produce a lashing out against South Korea. Groups in North Korea compete by expressing their “patriotic hostility” to the southern “Yankee Colony.” So some manner of shenanigans – a nuclear test for example – seems likely. While that too seems par-for-the-course in northeast Asia, there is also far less tolerance in South Korea now for North Korean bad behavior. Another direct North Korean strike against South Korea, as in 2010, could provoke long-expected retaliation from the South. There is a wide perception in South Korea that the government’s patience for North Korean strikes is finished, and that another one would be meet with serious counter-fire. And no one really knows were that would lead. With frosty relations at the highest levels, citizen exchange becomes all the more important.